Dog and baby safety is job one for Jen Shryock, founder of Dogs & Storks and certified dog behavior consultant. She helps parents understand the hows and whys of preparing dogs for the arrival of the new baby. When you consider there will suddenly be a lot of new smells and sounds for instance, baby crys or screams, you’ll need to know your dog’s level of sensitivity to sound as a stressor and then what to do to relieve that stress. Happy, scared, excited, nervous and avoidance signals exhibited by their dog are part of the behavior playbook taught to parents. Giving new parents the tools to deal in an appropriate and positive way to their dog’s reactions is important. When parents better understand dog behavior and subtle body language signals, fear of making mistakes with your child and your dog is not an every moment of every day companion. Say goodbye to some of your high stress! Dogs & Storks is an international program preparing families for dog and baby safety from the first homecoming, offering on-going support through their first year. 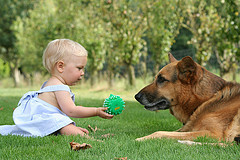 People have praised this training, saying it made the introduction of the baby to the dog a flawless process. Now there’s a “next stage” program that started up just last year. If you’ve tried this program or have had experience in this area, please share. This entry was posted in Mary Haight, Training and Behavior and tagged dog behavior, dogs & storks, dogs and babies, dogs and toddlers, kids and dogs on May 14, 2012 by Mary Haight.